Every culture in the world seems to have some version of the flute. The idea of blowing across a hole and splitting air to make music is not really that difficult to come up with so this isn't that surprising. But there are many different ways these instruments develop. In the Americas, many different flutes have existed for many, many years. And like all flutes, there are many stories about them. 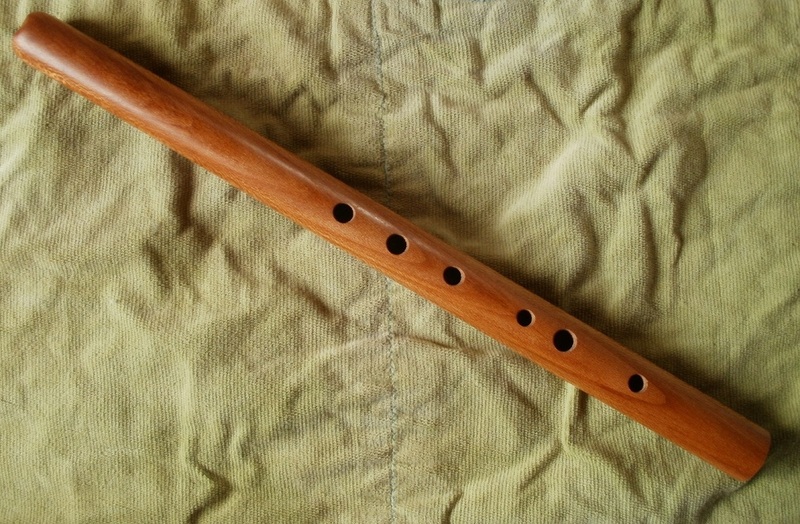 The Native American flute (sometimes called the Woodland flute or Plains flute though those two are not exactly the same) is held vertically and actually has more in common with the recorder than the concert flute. Both have a duct or a chamber that guides the air stream to the edge that creates sound. The Native American flute has an external duct and a different scale than the concert flute which is part of what creates it's individual sound. It is generally considered a North American instrument and yes, there are several different versions of this instrument in different tribes. Today, makers use Native American flute for instruments made by an officially enrolled Tribal person and Native Style flute for instruments made by someone without Native Ancestry. Both often use similar (though not always exactly the same) designs and both sometimes experiment. 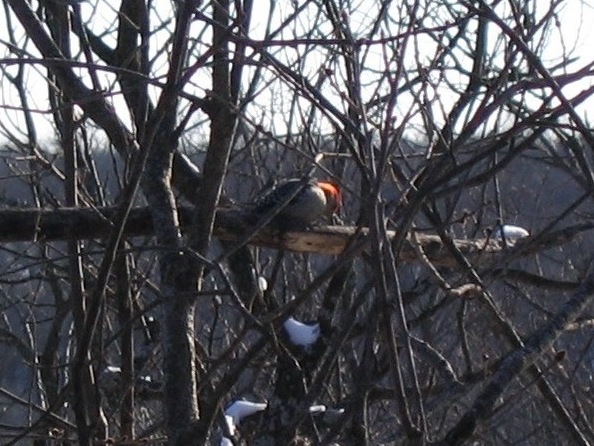 In some stories, the Native flute was invented by a young man who heard music on the breeze coming from a hollow cedar branch with holes made by a woodpecker. 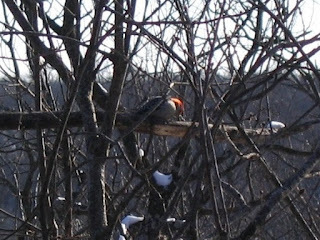 In others, the woodpecker is considered the musical inventor who gave the flute to people to express themselves better. Native American flutes were often used as courting instruments and to lure girls outside and away from their parents. Also useful for courting couples who are too shy to talk to each other! R. Carlos Nakai has said that unmarried girls from Native societies are still sometimes not allowed to attend his concerts and there are still far fewer women who play this instrument than men. Mary Youngblood is one of the more famous exceptions. Kokopelli (there are several different spellings) is possibly the most famous flute player from the Americas. The hunched figure playing a flute or pipe is found in ancient rock art all over the Southwest and Central America. There are often lines coming off of Kokopelli’s head that remind some people of antenna; a flute playing insect. Kokopelli is also one of the katchina figures-a masked dancer who chases the women while his wife Kokopelli-mana chases the boys. Some stories say that the hunched back is a sack and Kokopelli is a traveling salesman who plays flute to attract customers. Some say the sack is full of seeds, music or babies. 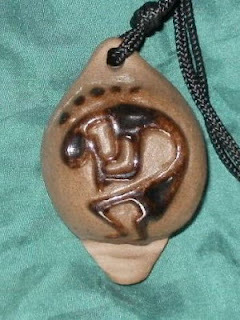 Kokopelli is generally considered a fertility god (like nearly all mythic flute players). He often brings rain with him when he travels and helps crops grow. Some scholars say that the Kokopelli myths can be used to track the spread of maize or corn throughout the Americas. Katherine Hoover’s “Kokopeli” is a very popular piece for the concert flute (an instrument more often played by women than men) meant to represent Kokopelli as a leader of the migrations of the Native Americans. What flute he plays is open to debate. The Native flute is held vertically which would match the rock art nicely. But archaeologists have also found several vertically held rim blown flutes (no ducts) in the desert Southwest that would also fit the silhouette we see. These flutes are sometimes called Ancestor Pueblo or Anasazi flutes (Pueblo is more polite, Anasazi is more widely used so knowing both is important). Again, they have a different scale than either the concert flute or the Native American flute and so have a different sound and tone. Diatonic Pueblo / Anasazi style Flute. Non-traditional scale and size but it gives you the idea. Jabuti (various spellings) is sometimes the name of a character in folktales from the Amazon rain forest. He is a small tortoise who plays pranks on all the other creatures and usually outwits them, though (like most tricksters) he sometimes manages to outwit himself as well. In Gerald McDermott’s story, Jabuti plays a flute and makes the creatures in the jungle all dance and sing. When the birds go to sing for the King of Heaven, Jabuti wants to go and play his flute. Vulture (who is not happy with the sneaky turtle) offers to carry Jabuti to the sky but then drops him on his back, shattering Jabuti’s shell. The other birds help patch his shell back together (Humpty Dumpty could have learned a thing or two from this tortoise) and Jabuti lives to play music and tricks another day. In other less Westernized stories, the flute playing tortoise is female and loves to dance. She often cons her way out of trouble or simply plays music to win others over to her side. The flute this character plays is not very well defined. Sometimes panpipes are pictured and other times a very general vertical flute is shown. I suspect her instrument choice changed depending on what flute was popular at the time. Meanwhile, in the Brer Rabbit tales from North America, Brer Turtle uses Brer Vulture’s feathers to make “quill pipes” after tricking Brer Vulture out of some honey. Brer Fox hears the wonderful music and steals the pipes from Brer Turtle. Brer Turtle sneaks up on Brer Fox, bites and hangs onto his toe until Brer Fox gives the pipes back. It is believed that both the Brer Rabbit and Jabuti/Tortoise tales have links to West African folktales, mixed with Native American stories that have taken on a life of their own. The image of a turtle with a round shell playing a flute looks a great deal like the basic Kokopelli image to me though I know of no direct connection between the two.